Now with summer in full swing, it is important to remember that flip flops, the popular chosen summer footwear of the masses, shouldn't be worn without some warning. Not all flip flops are the same, and there are some supportive, stylish ones out there such as the Spenco sandals recommended by our office. However cheap flip flops are plentiful, and it is tempting to buy one in each fashionable color to match each outfit, but beware! Although yes, they are easy to slip on and off and convenient to wear, it is important to be aware of some of the harmful effects of wearing flimsy flip flops. -It can affect your bunion, or that big bump on the side of the big toe - Because of the lack of support, if you have a bunion, it can make it worse. If you don't have bunion, the biomechanics effects can cause the big toe joint to slip out of line, aggravating this area and possibly contribute to the formation of a bunion. -Stress fractures - traditional Flip flops have virtually no support for the bones of your foot, and this can lead to stress fractures on certain bones. Stress fractures are due to repetitive micro trauma causing areas of increased pressure on your bones, and walking long distances in flip flops or unsupportive shoes can certainly be a cause. 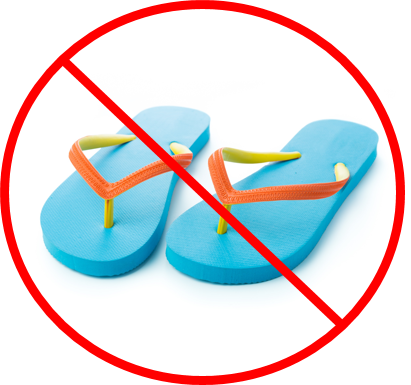 -bacteria and fungus - A study by the University of Miami in 2009 determined that there were more than 18,000 bacteria on just one flip flop! Thisis due to the fact that shoes protect our feet from outside bacteria and fungus, and when there is no barrier, then these bacteria come onto the footbed and and come in contact with the soles of your feet. -it can cause heel pain - due to the lack of arch support, the plantar fascia (the band of tissue that goes from your heel, across the arch, and inserts in the ball of your foot) is stretched out repeatedly with each step you take. This cause inflammation of the tissue, which you will feel as heel pain, or plantar fasciitis. -it can cause pain around the ankle - you may feel pain on the inner part of the ankle due to the stretching out of the posterior tibial tendon. This tendon is responsible for holding your arch up, and in flimsy flip flops without arch support, that tendon is overworked and this can cause pain and inflammation to the area as well, called posterior tibial tendonitis. If you do need to wear flip flops, wearing them occasionally to go to the pool or beach should not have any detrimentally effects. But remember not to use it as a fashion statement, or you could be sorry! If you do have foot or anke pain due to flip fops, or any other shoes, or any other activity, give our office a call. Our doctors will do a thorough exam and come up with a treatment plan for any ailment you may have. Give us a call at Prairie Path Foot and Ankle Clinic and we will have you on your way, pain free, in no time.